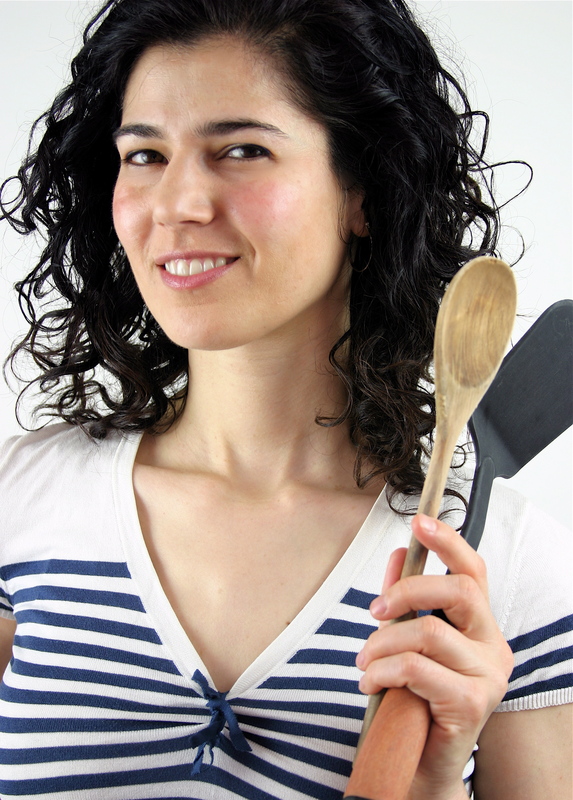 A cook, educator, and author of Lucid Food: Cooking for an Eco-Conscious Life, Louisa attended The Natural Gourmet Institute, and has cooked at restaurants in New York and San Francisco, including Aquavit, Pure Food and Wine, Millennium, and Roxanne’s. She has also cooked for The Colbert Report, Isabella Rossellini, Marcia Gay Harden, Glamour, Domino, Men’s Health, Women’s Health, Diesel, Converse, and the Sundance Channel. When she isn’t preparing fresh, local cuisine, Louisa enjoys exploring the five boroughs on her bike. She lives in Williamsburg, Brooklyn. 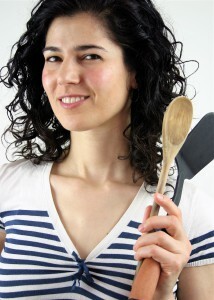 Watch Louisa’s cooking videos and read the Lucid Food blog at www.lucidfood.com. Tell us about some of your favorite fall ingredients, and how you like to use them. There are so many wonderful ingredients around right now; when I go to the farmers’ market, I come home with my shopping bags bursting because everything looks so pretty. 1. Mushrooms. These are technically around all year long, but I start to crave them when the weather takes on a chill. I regularly use shiitakes, portabellas, oyster mushrooms, and maitakes (aka “hen of the woods”). I like to slice the mushrooms and put them in a garlicky marinade for at least a few hours, then I grill them or sear them in a pan, and then finish them in the oven. They are so meaty and juicy, and can work as the starring ingredient in a warm salad, or with a starch like mashed root vegetables. 2. Red kuri squash. I discovered these a few years ago and they’ve become my favorite winter squash. Their flesh is rich and buttery, with less water content than a butternut squash. They are very much like kabocha squash, but with a naturally savory flavor and a gorgeous tawny color. I will cut up chunks of this squash and throw them in with anything I’m cooking, like grains, beans, or roasted chicken. I like to make a pureed soup with nothing more than caramelized onions, apples, and a little cinnamon and cayenne. It’s so full-flavored that it doesn’t need cream. I leave the skin on the squash, so the soup has a stunning bright orange color. 3. Chioggia or candy stripe beets. These beets are pink on the outside, and striped pink and white on the inside. They’re really incredible looking. They have a milder flavor than red beets, and they don’t stain your hands the same way when you cut them open. Chioggias lose their special markings when cooked, so I like to eat them raw in salads. I’ve found that a creamy dressing balances the earthy, slightly bitter taste of beets, so I’ll start with crème fraîche and whisk in a little olive oil, white wine vinegar, and minced garlic. I’ll shave the chioggias very thinly on a mandolin along with fennel and radishes, toss in some fresh dill, and add whole grains like farro or wheat berries. The salad is full of pinks, reds, and greens, and it’s hearty enough for a meal. 4. Red cabbage. While working in restaurants and catering, a few ribbons of cabbage were always an obvious choice for a dramatic garnish. But in addition to their striking color, I always think of cabbage as “the vegetable that keeps on giving”: one medium-sized head will give you countless cups of shredded cabbage, always helpful in an economic recession. Lately I’ve been making a warm salad of shaved sweet apples and red cabbage in a Dijon vinaigrette, with seared turkey and fennel sausage tossed in at the end. A simple red cabbage slaw of lime juice and peanuts always works for me. This fall I’m excited because a Russian friend has promised to show me how she makes her borscht, the warming soup of beets, red cabbage, and onions that gets Russians through the winter. 5. Concord grapes. I love walking by a table of these at the farmers’ market; they smell like candy. They taste delicious, but have a very tart finish, so I like to make them into juice: I stem and rinse a bunch of grapes, then put them in a food processor with a cup of filtered water and process for thirty seconds to a minute, and then strain. The pure, fresh juice mixed with a little seltzer is heavenly. I made a very tasty glaze of fresh grape juice and honey, but when I brushed it on roasted chicken, the chicken turned blue, so I’ve decided Concords are more suited to desserts, where blues and purples make a little more sense. Concords make great jelly, of course. I’m lucky because my cousin in Vermont just sent me some that he made. Mmm, perfect on a scone. Thanksgiving is right around the corner. What are a few of your favorite Thanksgiving foods? Summer cooking is great, but Thanksgiving is definitely my favorite time of year for food. I grew up in a home with vastly different religions—my father is Muslim and my mother is Jewish—and Thanksgiving was the one holiday where everyone felt comfortable, because we could all come together around food. I’m sure that sense of closeness and acceptance are a big part of why I love the foods of this season. There are so many dishes that are an essential part of my Thanksgiving experience. Sweet potatoes cooked with orange juice and butter, raw cranberry relish with sugar and orange zest, and cornbread come to mind. Growing up, my job at Thanksgiving was to make the cornbread, and we had one of those cast-iron pans with corncob shapes. I don’t understand why everyone doesn’t use those, they are so cute! In general, I don’t really eat much turkey, but a good heritage turkey is wonderful at this time of year. Cornbread stuffing is my favorite, with plenty of mushrooms, onions, celery and sage. As a sort of second stuffing, we always have my dad’s Persian rice, made with French lentils, onions, and dill, cooked so it’s crispy and golden on the bottom. I don’t care how full I am, I will eat as much pumpkin pie with homemade whipped cream as you put in front of me. That’s one of the few things that I do differently from my mother. I emulate all of her Thanksgiving food choices, but she has always used canned pumpkin pie filling from Libby’s, whereas I roast my own squash and make a puree. She’s an excellent cook, but I know some of my retro cooking habits like this one make her roll her eyes. Can you give us any tips for an eco-conscious turkey day? 1. Compost your vegetable scraps! It saves so much garbage from going into a landfill. If you don’t have a backyard where you can bury your veggies, see if there’s a compost drop-off at a community garden or farmers’ market near you. 2. Order a turkey from a small local farm. The heritage breeds that you’ll find at farmers’ markets and co-ops (that’s food cooperatives, not chicken coops!) taste infinitely better than what you will find at the supermarket, and without the fillers and hormones, and horror stories of abuse at factory farms that annually make the news at the holiday season. 3. Freeze leftovers. After cutting all of the meat from the turkey, make sandwiches, soups, even turkey quesadillas. If you still have leftovers after three days, freeze them; I guarantee you’ll be grateful for them two weeks later. 4. Skip the paper towels and use washable cloth dishtowels for cleaning. Paper towels are made from trees, and they demand a lot of resources just to be used once and thrown away, from the trees themselves, to chemical processing, packaging and shipping. If you have to use paper towels, compost them. 5. Try to avoid using white sugar. White sugar production involves harsh chemical processes, and polluted runoff has destroyed large areas of the Florida Everglades and Australia’s Great Barrier Reef. Start a new tradition this year, and make pies with locally produced sweeteners like honey, maple sugar, date sugar, brown rice syrup, or sorghum. Less processed sweeteners have lots of character, no chemicals, and are gentler on your body’s blood sugar levels. Editor’s Note: If you like what you just read, show some comment love for Louisa below–and be sure to check out our first interview with Louisa here. Nikki Jong is an earth-friendly eater who’s never met a vegetable she didn’t adore. In addition to her edible plant obsession, she nurses a neverending hankering for sustainable seafood and is a champion oyster eater (and shucker). Nikki loves hoppy beers, bold, spicy reds, and believes that nothing beats a cold glass of moscato d’Asti on a hot summer afternoon. As Editor of The Menuism Blog, she has the pleasure of interviewing some of the hungriest, thirstiest and most ambitious folks in food and wine.